No matter how much we sometimes wish we could replace conference rooms, they are often the best place to get a fair amount of work done. Even in a digital era, face-to-face meetings are still extremely valuable, and that means it’s worth it to invest in technology that can make your time spent together with your team more effortless and seamless than ever before. How many times have you been in a meeting room and everyone is waiting to get started, only to be held up by some critical piece of technology that isn’t working correctly? Multiply those minutes (or hours) by the number of people in the room, and you can see why it’s so important to make sure that you have the best setup you can possibly get: When you consider the cost of time, you simply can’t afford not to. Here are 6 ways that technology can transform your conference room and meetings. Speaking of meetings we’ve all been in, how about the one where everyone has to wait while the presenter looks for the right “dongle” in order to connect their computer to the projector, only to find out that the right one isn’t even in the building? The point of technology is to make things easier, not harder, and having to maintain a collection of different adapters just to make sure that we never waste time again is certainly not the easiest way of doing things. Instead, consider using a wireless presentation system to simplify the whole process for everyone. This lets you cut out the dongles and the time spent waiting while we try to figure out what fits what. Instead, simply get your presentation on the screen and get down to business. The idea behind a whiteboard is simple: it’s a big empty canvas where multiple team members can collaborate by drawing and charting out their ideas. It’s really useful for iterating broad-stroke concepts and fleshing them out into actionable items. The problem is, it doesn’t travel very well, especially when not all of your team members are necessarily in the office or even in the country. Interactive whiteboards solve that problem by capturing what’s being drawn and sharing that in a digital space. There are a few different ways they achieve this, some more physical than others, but the effect is a shared space to doodle ideas and hash out strategies. These days, you can count on everyone having the ability to put a camera on their face and beam it live anywhere else in the world with an internet connection. The thing is, a standard video chat doesn’t actually put someone in the room in a tangible sense. 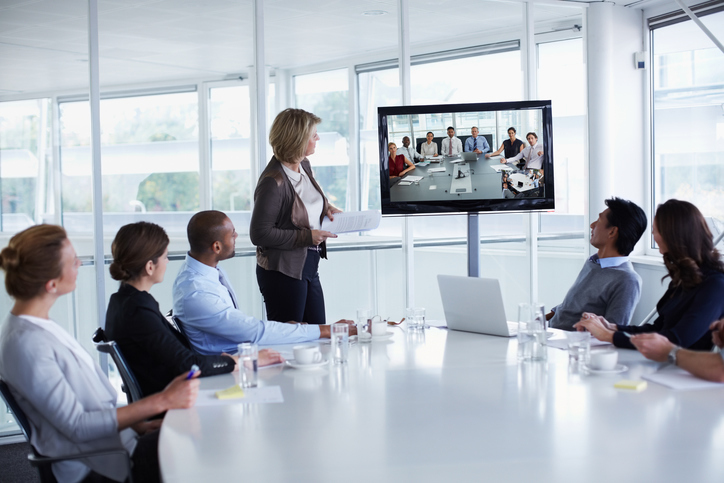 They can’t see everyone the way you can if you’re physically sitting in the meeting, and they can’t see what people are looking at without someone taking them on a “walk.” You need to make sure that you’re adequately prepared for your video conferencing needs. When you’re thinking about setting up your conference room, think of what would be useful for someone in a meeting to see. Do you rely on designs or drawings, which would mean that you want an overhead view of the table? Do you often have presentations, and should you have a camera setup to capture that? Do remote workers need to give a presentation and, if so, is the screen in a convenient place for the people in the room? When you’re thinking about video, don’t overlook the basics because they’re vital to providing a great experience. Is everything well lit? Check how it looks on camera and make sure that everyone will be easy to see. What are you using to capture sound? Mic placement and room acoustics can play a big role in whether or not your audio is clear. Take the time to test out your equipment and make sure that you’ve done everything you can to make the experience great. This should go without saying, but solid WiFi backed by a fast, reliable connection is a must for any conference room in 2018. In fact, most of the technology that will transform your meetings and your business depends on it.Everyone in the room should be able to log in and stream video, both upstream and downstream, with a reasonable level of quality. Put the bandwidth in place, and ensure that your WiFi is easy for both employees and guests to connect to. Again, these small upgrades are far less costly to troubleshoot ahead of time so you’re not wasting your employees’ time when they are in a conference room to get work done. A lot of what goes into having a great meeting is the work that happens before the meeting. Structuring deliverables, making sure that people are hitting their goals, planning timetables to keep everything on schedule—everything that goes into making sure the trains are running on time. After all, it’s not going to be a very productive meeting if people aren’t prepared. Use tools like Trello, Asana, or Basecamp to make sure that everyone’s up to speed, and that the things you talked about getting done in advance of your meeting are divvied up and will actually get done. With hybrid communication tools like Slack and even with traditional email, there are also tools that have emerged to solve common headaches teams face. For meetings, the number one difficulty is finding a time that works for everyone involved, and making sure that you’ve followed up with anyone you haven’t yet heard from. Several bots have emerged to try and solve that problem, from Slack’s Meeting Bot and Doodle’s Meekan to the multi-platform x.ai. With these tools, you can make herding cats a tedious task of the past. Even though more and more workers and spending time outside of the office, many times a physical meeting is still simply the best way to get stuff done. Maximizing your in-person time is a must, so investing in technology that can make it easier for you to collaborate effectively is well worth the effort. Here’s what you can do right now to transform your conference room and your meetings. Offer a wireless presentation solution so you don’t waste time plugging things in. Use an interactive whiteboard to collaborate with team members inside and outside the office. Double check your video conferencing setup and pay attention to the details. Use project management platforms to make sure work gets done. Take advantage of scheduling bots to remove friction from the process of organizing a meeting.